The most obvious outcome of the reproductive process still remains the generation of individuals of similar design. The rules of heredity determine the process by which traits and characteristics are reliably inherited. Let us take a closer look at these rules. Observe the ears of all the students in the class. Prepare a list of students having free or attached earlobes and calculate the percentage of students having each (Fig. 9.2). Find out about the earlobes of the parents of each student in the class. Correlate the earlobe type of each student with that of their parents. Based on this evidence, suggest a possible rule for the inheritance of earlobe types. Mendel’s Contributions The rules for inheritance of such traits in human beings are related to the fact that both the father and the mother contribute practically equal amounts of genetic material to the child. This means that each trait can be influenced by both paternal and maternal DNA. Thus, for each trait there will be two versions in each child. What will, then, the trait seen in the child be? Mendel (see box) worked out the main rules of such inheritance, and it is interesting to look at some of his experiments from more than a century ago. Mendel was educated in a monastery and went on to study science and mathematics at the University of Vienna. Failure in the examinations for a teaching certificate did not suppress his zeal for scientific quest. He went back to his monastery and started growing peas. Many others had studied the inheritance of traits in peas and other organisms earlier, but Mendel blended his knowledge of science and mathematics and was the first one to keep count of individuals exhibiting a particular trait in each generation. This helped him to arrive at the laws of inheritance that we have discussed in the main text. Mendel used a number of contrasting visible characters of garden peas – round/wrinkled seeds, tall/short plants, white/violet flowers and so on. He took pea plants with different characteristics – a tall plant and a short plant, produced progeny from them, and calculated the percentages of tall or short progeny. only the tallness trait was expressed. Thus, two copies of the trait are inherited in each sexually reproducing organism. These two may be identical, or may be different, depending on the parentage. A pattern of inheritance can be worked out with this assumption, as shown in Fig. 9.3. In Fig. 9.3, what experiment would we do to confirm that the F2 generation did in fact have a 1:2:1 ratio of TT, Tt and trait combinations? 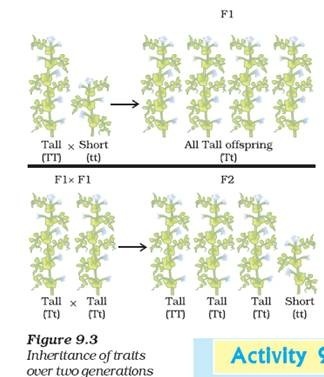 In this explanation, both TT and Tt are tall plants, while only tt is a short plant. In other words, a single copy of ‘T’ is enough to make the plant tall, while both copies have to be ‘t’ for the plant to be short. Traits like ‘T’ are called dominant traits, while those that behave like ‘t’ are called recessive traits. Work out which trait would be considered dominant and which one recessive in Fig. 9.4. What happens when pea plants showing two different characteristics, rather than just one, are bred with each other? What do the progeny of a tall plant with round seeds and a short plant with wrinkled-seeds look like? They are all tall and have round seeds. Tallness and round seeds are thus dominant traits. 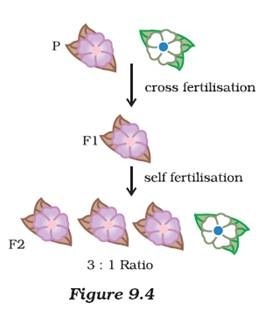 But what happens when these F1 progeny are used to generate F2 progeny by self-pollination? 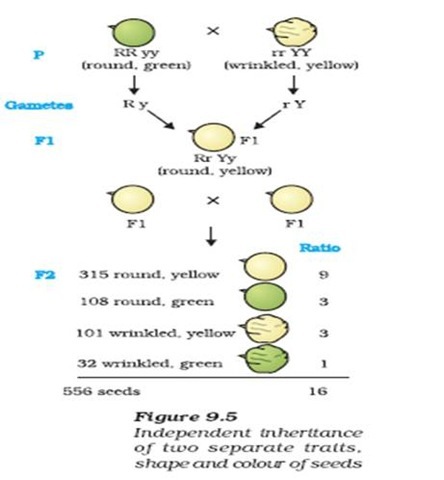 A Mendelian experiment will find that some F2 progeny are tall plants with round seeds, and some were short plants with wrinkled seeds. However, there would also be some F2 progeny that showed new mixtures. Some of them would be tall, but have wrinkled seeds, while others would be short, but have round seeds. Thus, the tall/short trait and the round seed/wrinkled seed trait are independently inherited. Another example is shown in Fig. 9.5. Great information you got here. You really fully grasp this and I am glad I found this post by you thanks a bunch. its a great site to learn. i want anssers to the q’s!! !